President Obama’s trip to South Africa this week aims to strengthen economic ties between the two countries at a time when China’s growing economic presence in the region has added a new dynamic. South Africans appear to recognize the competing economic influence of the two world powers – and to welcome ties with both countries. 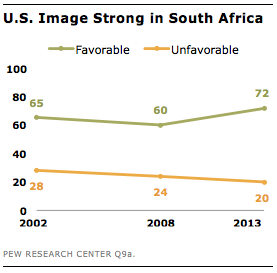 According to a new Pew Research Center poll, about seven-in-ten (72%) say the U.S. has a great deal or fair amount of influence on economic conditions in South Africa; 71% say the same about China. 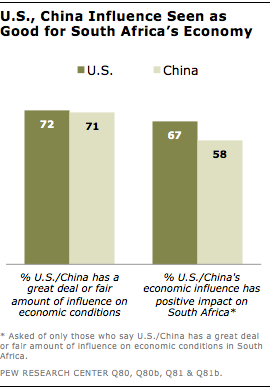 Among those who believe the U.S. and China have a significant economic impact on their country, majorities say both nations’ influence is a good thing for South Africa: 67% for the U.S. and 58% for China. Regardless, Obama is likely to receive a warm welcome on the visit. Roughly seven-in-ten (72%) hold a favorable view of the U.S., a higher percentage than in either 2002 or 2008. And a broad majority (74%) express confidence in Obama to do the right thing in world affairs, much higher than the 32% in 2008 who trusted his predecessor, President George W. Bush.